*(Via WAFF-TV) – A tense stand off between protesters and police ended with the use of flash bombs, tear gas canisters in another heated night in Ferguson, MO. 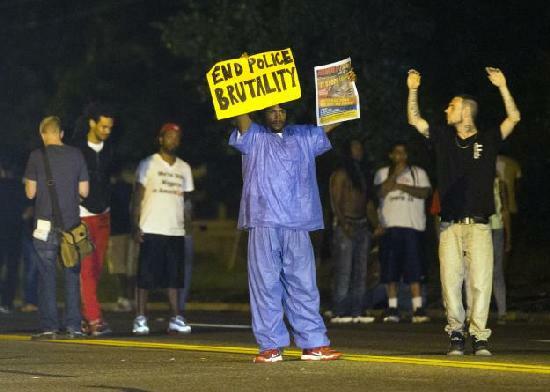 Since the shooting death of unarmed teenager Michael Brown, the streets of Ferguson, MO have been tense. That hasn’t stop demonstrators from seeking answers and justice. Late Monday, police over loudspeakers told the remaining protesters to leave the area “unless they were credentialed media” and would be subject to arrest, but arrests came toward midnight as police moved protesters and media to another area. Other protesters were arrested earlier Monday as the night fell on Ferguson, MO, the first night in which the National Guard of Missouri helped other state authorities secure and police the streets. Some from the crowd may have taunted police by throwing water bottles at police, prompting an increased police presence that halted the protest march Monday evening. Agitators came from across the country, Johnson said, and among the more the 30 arrested were people from New York and California.